With almost 6 hours of content, specifically covering the turbo speed format, this pack is designed to help get you to the next level of these profitable poker games. Whether you're a new player starting out, a hyper turbo player that wants to add action or a mid stakes turbo pro, this pack has valuable content. Coffeeyay is the leader in end game coaching and strategy. He coaches players from the $7 level to the $1,000 level and is known for cutting through the "noise" and offering provable solutions in end game HUSNG situations. He has built a lot of the poker strategy/variables in the popular CoffeeHUD, as well as CoffeeCalcs. His Math in HUSNGs pack has been very well received and he is a lead coach in the HUSNG.com Staking Program. Mattraq1's overview of his content and his intentions for this pack. In this video, Mattraq teaches about a readless preflop range, learning about your opponent on the flop, recognizing different flop textures, knowing when to bet the turn, and river decisions. Mattraq1 talks about flop play when playing readless from the small blind. Topics in this video include readless defending range, adjustments vs larger-than-minraise opens, and check-raising. In this one, Mattraq teaches about defending a 3B from SB, stack size effects on hand values, 4B, 3B from BB, default hand selection, and multiple board textures. Mattraq1 goes over a push-fold chart for picking hands to 3bet with when playing from the big blind. This video covers manipulating villain expected actions, inaccurate HUD stats, and overbetting strategies. Mattraq1 applies the above concepts to real games at the $55 buyin. Mattraq1 applies the above concepts to real games at the $110 buyin. The first few hands of Mattraq1's review of a $110 game he played against an opponent he had no reads on. Faarcyde teaches about player types, raise vs. fold basics, preflop considerations, flop strategies, limping, and common mistakes. Faarcyde discusses the role of limping in turbos. Faarcyde reviews ten interesting hands against a variety of players from recs to regs at the $60 buyin. Faarcyde's first hand review in this pack. Faarcyde analyzes six more interesting hands. Coffeeyay visits RyPac13 and reviews a game they played against each other. Coffeeyay reviews a couple of hands that he played against RyPac13 (LeoSpaceman). Pre black friday, Mattraq was a HUSNG professional. With the uncertainty that came with black friday, he decided to stay in the USA and finish up his undergraduate degree. The game wouldn't leave him, however. He continued to play HUSNGs while in school and playing live poker as well. He made an estimated $43,000 in about 7500 turbo speed HUSNGs during 2012-2013. In 2014, he's finished up his schooling and has been playing the live MTT circuit as well. He scored big with a $40,000 win at Cherokee, and he also played a full 2014 WSOP schedule. In 2014 HUSNGs, he's made roughly $4,500 in just over 1,000 games. Faarcyde has a wide range of poker experience. He's well known in the 6 max SNG community, as well as both turbo and hyper turbo circles. However, his primary game has long been turbo speed HUSNGs, where he resides at the $100 buyin. He is a very experienced coach for many of these games as well. Below is his lifetime turbo speed graph, he plays under the alias Faarcyde on PokerStars and Full Tilt Poker. His focus on this video pack is in bringing solid end game strategy to the end of turbo speed HUSNGs. 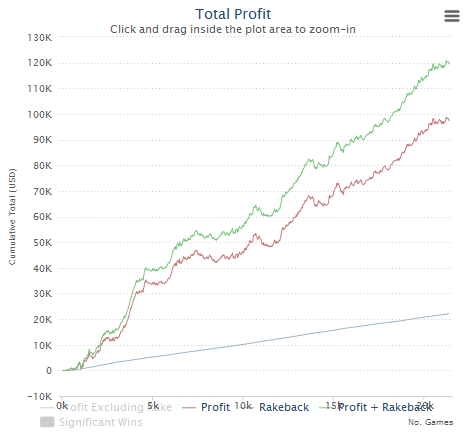 End game play is often overlooked in turbo speed HUSNGs, however, given that mid stakes hyper turbo players can hold ROIs over 5% against much of the field in only 3 minute games, it quickly becomes obvious how much additional profit can be made in turbo HUSNGs by improving your end game. note: This pack requires Windows and does not work in a virtual machine. We are currently working on a solution for Mac OS users. If you are a Mac OS user and are interested in this pack, please e-mail us for details.